I share my goals and dreams with the SBTDC and they help keep me in the tracks, like the lane assist in a car. When I start going too far to the side, they shake me a little bit and push me back over. 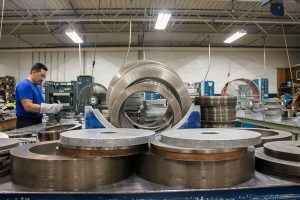 WHAT THEY DO Since 1993, Advanced Superabrasives, Inc. (ASI) has been a manufacturer of high-end and extreme-precision diamond and CBN grinding wheels for any industry. Their grinding wheels are used to create tools that need to be precise down to the micron—thinner than a human hair. For that kind of precision, the tool needs to be ground rather than laser-cut or eroded. ASI makes all of their products in house, taking the raw material through the manufacturing process to the final product. 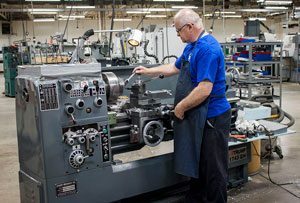 What makes them unique is their ability to customize wheels with different shapes, diamonds, and bonds as needed for each job, allowing them to produce wheels for a variety of industries rather than focusing exclusively on a single industry like woodworking, aerospace, automotive or silicone wafer grinding. 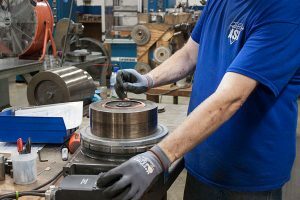 ASI is about selling a solution to a problem rather than a wheel from a catalog, and prides themselves on working with clients to increase production and value. This goes beyond manufacturing and client training to building grinding equipment and filtration systems that compliment the wheels, helping them last longer and perform better. UNDER THE CAPE In 1993, Atilla Szucs went out on his own and started what was then Advanced Tool. Jonathan, his son, had no desire to follow in his father’s footsteps and instead wanted to be a doctor. He enrolled in Pre-Med at UNC Charlotte. It was during a hospital lab for dissection that he realized medicine might not actually be the right fit. He transferred to Western Carolina and graduated with a degree in electrical- and computer-engineering technology. With a new found love for the industry, he is back at ASI, never content unless there is grease in his hair and oil splattered across his shirt. He thrives on meeting clients and working with their machines, finding solutions for faster and better production, whether it is for joints in the medical industry or a brand new 787 jet. He can even claim the record for furthest export in the state of North Carolina with a grinding wheel on Mars. 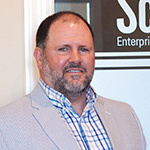 GOING FROM SMALL BUSINESS TO MIDSIZE ASI is perched at the top of the small businesses in their market and they are ready to make the leap to midsized company. The SBTDC is helping with that transition. Jonathan and his counselor compared ASI to four competitors which gave them areas for improvement and showed how ASI fits into the overall market. Now it is all about opening up multiple product lines. For their entire 24-year history, they have only produced a resin-bonded wheel, but this year they added metal bonded and plan to eventually add vitrified and hybrid. After that, Jonathan foresees a snowball effect in revenue and hiring. 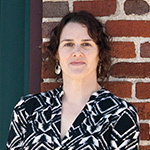 ASI has already grown to 40 employees since working with the SBTDC, a 33% increase. Revenues are up 15%, and in the machinist division, they are up 50%. They added the new metal bonded wheel in January, and they are now in 26 countries. 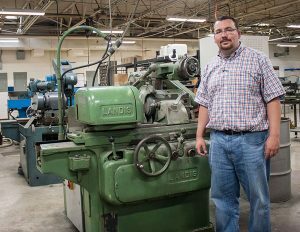 LOCAL HERO IMPROVES LIVES ASI has felt the familiar struggle of finding skilled workers. Jonathan believes it is partly due to the industry’s bad reputation, but part of the problem is a gap in vocational training and exposure to potential career paths. So, ASI offers internships to high school seniors as well as apprenticeships to high school graduates. The interns work half days, receive $10 an hour and discover whether or not this is for them. The apprenticeship lasts four years and ASI pays 100% of their tuition and books at a community college while they get an degree. If they choose to continue with a four-year degree, then 100% of that will be covered as well. Jonathan is also on advisory boards for the county schools, community colleges and universities and is determined to get his hands dirty and make a difference.